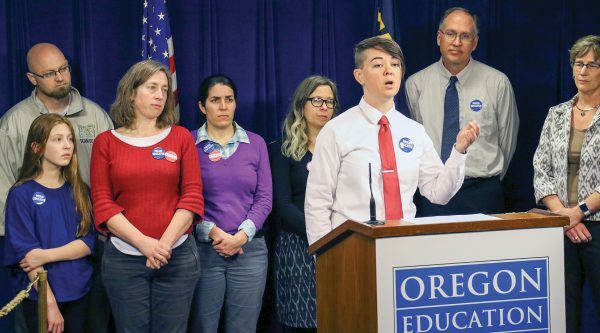 Hundreds of educators from across the state passed up a traditional spring break to spend a day in Salem bringing attention to the impact Oregon’s budget crisis will have on their classrooms. Our second Legislative Engagement and Training Day took place on March 27, and began with a training in the morning, and meetings with legislators in the afternoon. OEA members and students pressed their elected o cials on several education issues. “As legislators have been piecing together a budget, they have signaled major cuts to education. With the budget being put forward, our class sizes will continue to grow, essential programs will be cut, and learning will su er,” said OEA President Hanna Vaandering. Unless the legislature finds additional revenue, an additional 3,000 educators could be laid off for the upcoming school year. Educators stressed their fear that cutting more sta could push their packed classrooms to the breaking point. Oregon class sizes are already among the nation’s largest. Kelsy Dunlap of McKay High School shares her story of skyrocketing class sizes with lawmakers. Kelsy Dunlap, a fifth-year teacher at McKay High School in Salem, spoke about how in her second year teaching, she had 46 students in her 9th grade physical science class. “With 46 students in a room, I simply do not have the capacity to meet with every student and give them the personal attention they need,” Kelsy explained. Fear of larger classes was repeated throughout the day’s meetings with legislators. Educators told stories of class sizes so large that students were forced to sit on counters and floors. One story involved a first-year teacher from Central Point who had 58 students in her full-day Kindergarten classroom. Our message was simple: let’s fix Oregon’s dead-last corporate tax rate and invest the money in education. Educators pay their taxes — it’s time for large corporations to pay their fair share.